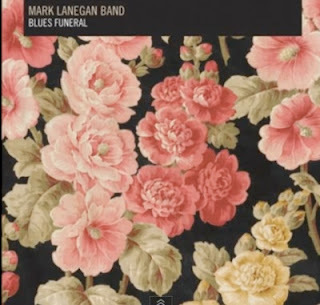 If you a fan of grunge rock, there is a chance you have heard of Mark Lanegan. Lanegan is an American musician who started out in 1985, forming the grunge band Screaming Trees. He began his solo career way back in 1990 when he released his album "Winding Sheets". Mark Lanegan was born in 1964 in Ellensburg, Washington. Having not been a huge fan of the grunge movement of the late 1980s-early 1990s, I had not been aware of him until earlier this year. I discovered him on one of those days were I was browsing through 'artists you also might like'. The cover art of "Blues Funeral" intrigued me, but nothing could have prepared me for the music I was about to hear. For starters, "Blues Funeral" is not very grungy. This is an alternative blues-rock album and nothing more or less. I didn't know this until after I had listened to some samples on Amazon. So I decided to give this record a try. This album blew me away. Lanegan does what he was good at so well that he doesn't try to be something he is not. While the subtle grunge influences do show up from time to time, this is an album that is startlingly honest and bitterly sorrowful. The guitar work is sheer wizardry, second to none. Lanegan's band blend buzzing, crunchy alternative rock riffs with slower-tempo and amazingly melodic acoustic blues plucking. The band weaves keyboard atmospheric work into the mix on many occasions, which help to accentuate the bleak nature of this album. As expected, the drum work is tight, but not overbearing, allowing plenty of room for the other instruments to shine. This is not even to mention Lanegan's vocals. Lanegan has a very distinctive baritone voice that has been described as "scratchy as a three-day beard yet as supple and pliable as moccasin leather." I find this description to be quite accurate. This differs from typically nasal high pitched singing and bland yelling found in a lot of grunge rock today. His voice further deepens the sense of tragedy you get when listening to this record. That was one asset to his singing that hooked me right away. Not many singers are willing to go through the risk to sing quite like he does. For the vocals alone, this album gains points with me. "Blues Funeral" is a great album that should go down as one of 2012's best releases. I may even rank this in my top ten. It is that good. Take a listen to the blues below. Enjoy!